I really wish I could do that. Take control over our clothes. Throw some out. Organize and be in charge. But the truth is that when everything is washed we can´t fit it all in. So the clean clothes lie in stacks here and there and often they get mixed in with the dirty stuff and then ..oh well. I visited a family in Malmö who had built an extra wall between their bed and the window, hung two rods and with that created a small wardrobe. The stuff that did not fit in there had to go. Sure they also had a separate wardrobe for some folded clothes, but still this is freedom to me. I think I´m going to try this. Also the air from outside keeps it crisp and fresh. Don´t you think it looks nice? 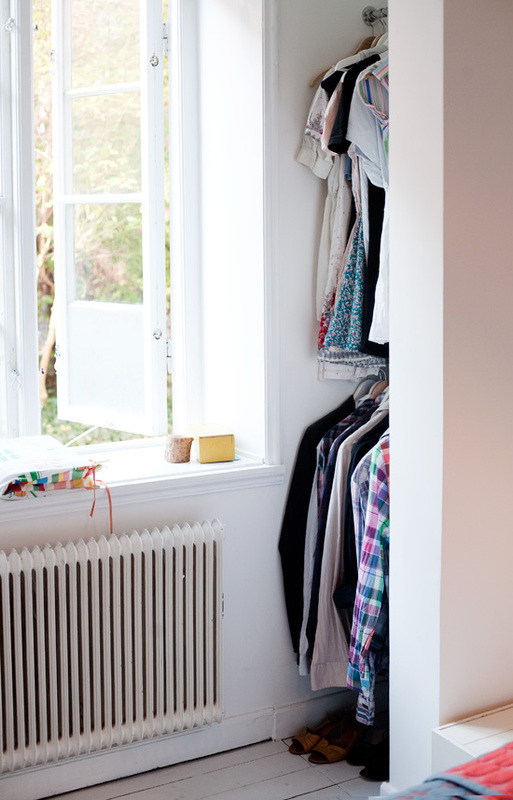 More clothes storage in this nesting-post. I’m inspired by this! I have a Laura Ashley pirate shirt that’s killing me! Vilken snygg och smart klädförvaring!